NEW YORK—As Nick Barter, 67, was carrying his new Christmas tree to his car, he stopped and stood still for a moment in the Depiero’s Country Farm parking lot. His kind but serious eyes squinted to see the scene before him—an infinite pink sky, and beneath it, a four-acre barren field that was a lovely medley of brown and green. It was a good place to fly drones, he thought. Barter, a video and audio technician, is one of the members of the New York City Drone User Group (NYCDUG), a community that has grown to 1,000 members in the last three years. They fly small, unmanned aerial vehicles, commonly known as drones, as a hobby. As a result of Barter’s finding, over a dozen New Yorkers and Jerseyites met at Depiero’s Country Farm in New Jersey on the 34 Fahrenheit afternoon of Jan. 11, with one enthusiast traveling from as far as North Westchester. Novice and experienced drone aficionados of all ages met to practice flying and exchange advice on topics from battery brands to wind speed apps. Many have built or at least customized their own drones. The motley crew—from 3-D printing instructors to filmmakers—have lofty goals in mind. Steve Cohen, the main organizer of the group, uses drones to teach STEM education at Bergen Community College, while Georgi Tushev and Nina Tushev, founders of Tushev Aerials, use drones to curb illegal logging and empower indigenous peoples in the Amazon rainforest. Bear in mind, they’re not flying predator drones, the ones that fire missiles in the Middle East. They’re flying small machines like DJY Phantoms, which look like 14-inch robot spiders but buzz like a swarm of bees. Small drones are growing increasingly popular because drones are beginning to revolutionize fields such as filmmaking, photography, and engineering, just to name a few. Since its founding in 2012, the group has met 40 times. Cohen said since many people received drones for Christmas this year, he will try to increase the meetings to every other week. But as interest in hobby drones surges, it becomes harder to find locations for safe and legal drone flying. “We met a couple times in parks, although we’re not supposed to,” Barter said. The technology is difficult to control even for the most experienced flyers. Cohen was chatting with a NYCDUG member about flying locations when he heard a drone’s monotonous hum behind him. He quickly turned around. A flyer was walking forward slowly, knees bent, arms out stretched, waiting to catch his falling drone in the parking lot. “You can’t fly it in the parking lot!” Cohen scolded. “I’m sorry! I’m sorry! It ran out of battery,” the flyer said as he caught the drone. There is a return home mode setting that allows his drone to return to the launch location when its battery dies. “That’s why you have to take off in the field!” Cohen said. According to Barter, drones crash during every meeting. Little things frequently go wrong. Even though Cohen is a seasoned drone maker, his antenna came loose while he was flying. His first drone, a Parrot AR Drone that he controlled from his iPhone, fell into the water at Flying Point Beach in Southampton. Cohen plodded into the October water to save his drone, but it never flew again. But that incident wasn’t as heartbreaking as when his QAV400—a more expensive and advanced drone that he spent more time customizing—fell into the Prospect Park lake. He never forgot the sound of the plop when its fiberglass body fell into the water. Nina Tushev, a consultant in indigenous rights for the United Nations, recently taught Peruvians how to use drones to help them catch illegal loggers in the Amazon rainforest. Rainforest Airforce: Indigenous Peoples Fly Drones to Protect their Land from GEORGI TUSHEV on Vimeo. She and her husband Georgi Tushev were flying their drone—one that had flown above the Peruvian Amazon rainforest—out on Depiero’s Country Farm when something went wrong. It crashed in the parking lot although he had launched it in the field. No one was hurt and nothing was damaged. Drones are very easy to crash, even for the most experienced flyers. Georgi Tushev began making remote-control airplanes in the early 2000s, and soon progressed to flying First Person View (FPV) planes, where a person navigates the plane with a radio and virtual reality goggles that receive the live feed from a small camera on the plane. The plane design allows the drone to fly farther and higher. In Peru last August, they traveled four hours by boat to go from one village to the next. Upon their arrival, they began to teach around 200 locals how to fly a drone. But the drone would not fly. They began to sweat. It was a sweltering day. They tried again, and again, fixing this part, adjusting another part. They couldn’t figure out why. Later that night, they realized the issue was that the drone was unbalanced because one tube was slightly slanted. “The technology is not reliable yet,” she said. Drones are difficult to fly and the technology is not always reliable, especially since many drone users customize their drones. But that doesn’t mean people can’t fly them well and responsibly. NYCDUG promotes safe flying practices. “There’s always going to be a few hot dogs who fly badly,” said Randy Slavin, the founder of New York City Drone Film Festival who was flying his drone—which he made himself—at the farm. Many people have seen the notorious videos of a drone crashing into skyscrapers, or read of a drone blocking a police medical helicopter from landing. But there are many great things that drones are doing—like finding missing hikers and creating beautiful, cost-effective aerial cinematography. “That’s why I hold a drones film festival, to showcase what drones can do when handled correctly,” Slavin said. New York City Drone Film Festival – March 7, 2015 NYC from NYCDFF on Vimeo. 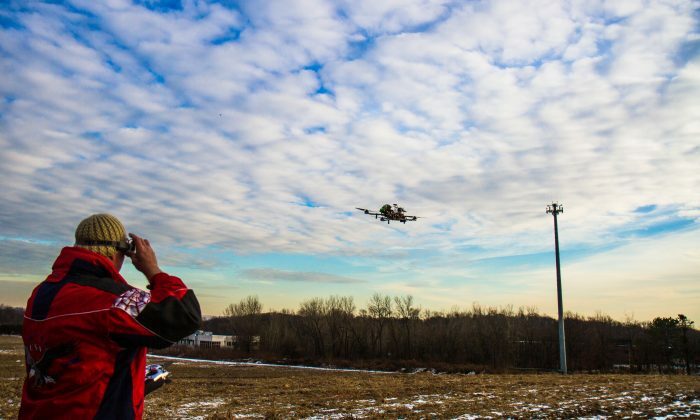 In early January, the Federal Aviation Administration (FAA) asked local law enforcements to police small drone flying. If the police do begin enforcing such rules, this means small drone flyers will not have a FAA-sanctioned field to meet regularly. In the mean time, this growing group of pioneers will continue to perfect their craft in vacant spaces like barren fields, a corn maze, and an abandoned park in South Jersey with knee-length grass. The FAA proposed allowing drones for a wide-range of business purposes, but excludes delivery services like Amazon's Prime Air.